To five-year-old Jack, Room is the entire world. It is where he was born and grew up; it's where he lives with his Ma as they learn and read and eat and sleep and play. At night, his Ma shuts him safely in the wardrobe, where he is meant to be asleep when Old Nick visits. Room is home to Jack, but to Ma, it is the prison where Old Nick has held her captive for seven years. Through determination, ingenuity, and fierce motherly love, Ma has created a life for Jack. But she knows it's not enough...not for her or for him. So first of all, the above synopsis is actually only half of the one posted on Goodreads because I feel that the full synopsis gives away too much of the book. If you’re going to read this, you should go into it not knowing much more than the premise. So don’t read the back, and don’t read the full summaries on Goodreads or Amazon. My expectations for Room were very high, but at the same time I was a little worried about a novel with a 5-year-old narrator. While this was partly what attracted me to the book, I thought it might be difficult to both convey enough information and still have the narrator really seem 5 years old. But ultimately, I think that Donoghue handled this wonderfully. Jack is a superb narrator and I do not think that this novel could have been told from any other point of view. His perspective is so unique, and while he may be a bit more descriptive than the average child, I did not have a problem believing that he was so young. Certain aspects of the novel do seem oversimplified, though: some things work out too easily, and others just aren’t as complicated as they should be. But I don’t think there is very much that Donoghue could have done to explain these while staying in Jack’s perspective; Jack couldn’t understand everything that was going on—and indeed, much of the novel focuses on Jack’s totally skewed perception of the world, resulting from growing up in the Room and from what his Ma told him. It’s heartbreaking but very interesting to see how Jack perceives the world. To that end, I loved how much detail Donoghue included regarding Jack’s perceptions and the various aspects of the world that he did not know or did not understand. I think she thought of many things that I would have never considered, like the fact that at age five Jack has never worn shoes before because there is no reason to within the confines of the Room. I did find the middle of the book kind of boring. While I didn’t have any trouble getting through it, that chunk of the book just doesn’t stand out to me. And in fact, while I enjoyed Jack’s narration and reading everything that happens to him and his Ma, I guess I was expecting more. I can’t say that I was really disappointed, but I will say that I didn't love Room as much as I expected to, nor was it the emotional roller coaster I anticipated (I feel like it moved too quickly to be extremely emotional). I really, really wanted to love this book. I wanted it to shred me up then piece me back together. But my expectations were too high. It was very interesting and compelling, with a fascinating premise, and I do consider it a worthwhile read, but it was not quite what I expected. I agree with your review. I had a hard time giving it a low-ish rating... I sort of felt obligated to rate it a 5. I went into Room with pretty low expectations. Like you write, what intrigued me about the book was the narrator, but that also seemed gimmicky to me. Having such a young narrator also makes it impossible to really tackle some of the issues in the book, but at end I thought that worked out for the best...it was left to the reader to parse everything Jack wrote, which was in some ways more horrifying than having the details of their lives laid out for us. I thought the weakest parts of the novel were those where Jack's mother had a true voice, when we heard her speaking to other people and describing her experience. I think expectations have a huge amount to do with our reaction to this book. Personally, I knew only that it was widely talked about and bandied about as a nomination for several prizes, so I didn't really know what to expect. 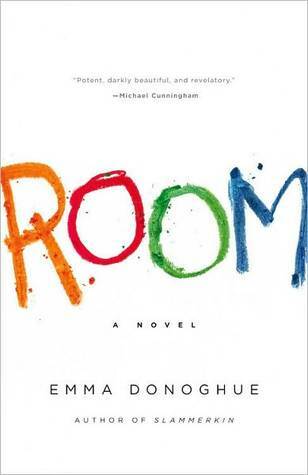 I found Room riveting - I read it in one day and stayed up past midnight to finish it - and rate it a 4.5 (not a five, though). I have had several people comment to me in conversation since that they don't think they could read Room as it would be too intense - and I think that's the expectation that trips people up. It's just not as dark as one would expect from the basic premise and, in fact, is essentially about hope and the resilience of the human spirit. I didn't actually read this book until my book club picked it and I loved it so much more than I thought I would. Even I felt claustrophobic reading about Jack's life in that confined space and it made me think about how it affects his mother who so clearly is falling apart. All of the things she did that he didn't know the meaning behind amazed me. I knew nothing going in except basically the premise you described, but I read my back cover after the fact and it gives away so much of the book! I think star ratings are hard, thats why I try not to do them on my blog. I feel like a 4 for some books isn't the same 4 I gave to another book. Arg! I like your review though, haven't read Room yet! Was a bit scared off by all the talk/hype. @confessionsofacommonreader -- I totally agree. Star ratings are completely different for each book. Because some books I love because they're fun and light, and other books I love because they're deep and insightful, and I always feel weird giving and fun and light book the same rating as a deep book. @Ellen -- I agree that the parts with Jack's mom speaking were much weaker. I didn't really think of it at the time, but now that you point it out I definitely think that's the case. I absolutely adored this book. It might be because I'm a psychology major and found everything so interesting. I might not have given it 5 stars, but at least a solid four star rating in my book. I just wish that there was a follow up book to explain how he grows up. Can you imagine Jack in school or his first girlfriend? Now that would be extremely interesting.